This page lists tricks and info for Survival Kids (GBC). Ending 1: Flee by helicopter. This is done by listening to the working radio to find about the ongoing search for survivors and then building an SOS sign at the beach. Ending 2: Flee on raft, die at sea. After finding out the search is called off (wait 2 days after finding out about the search), build a raft at the beach but fail to bring enough food and water. It seems 3 "good" foods and a full canteen is required to survive. If Bub wasn't rescued from the scrap, you will obtain this ending regardless. Fruits, Berries, Grasses and some mushrooms are considered "good". Ending 3: Meet other kid and wait 100 days. In order to meet the other kid, you have to survive the raft event and then check any of the two campsites that will appear thereafter. Then go back to the ship and the kid will appear. Ending 4: Leave by ship alone. Don't inspect any campsite and collect the gem from the desert rather than from the other kid. Ending 5: Leave by ship with other kid, other kid dies. Meet the other kid but his affection towards you is below a certain point (see the affection memory address). Ending 6: Leave by ship with other kid, normal ending. Meet the other kid and his affection towards you is high enough for him to survive but not high enough for him to love you. Ending 7: Wait 100 days alone. Wait until the 100th day without meeting the other kid. Ending 8: Leave by ship with other kid, wedding ending. Meet the other kid and his affection towards you is high enough (240 or higher) for him to love you. It is possible to save a game, obtain an ending and then load that saved game to go on to obtain other endings. This means you can do an "all endings" run. Nursing the other kid: After meeting the other kid, his affection towards you will be 0. It can not go below 0. You can give him certain items to influence his affection - see here for a list. The affection memory address is $C5F6 (System Bus). Shuffling effects of grasses and mushrooms: There are two possible scenarios for the mushroom/grass locations and effects. The game decides on one the moment the intro cutscene ends and keeps it forever. See here for a breakdown. Weird berry: In order for Bub to give you the weird berry, you have to fix the hut and neglect to bring him along on the raft. Pendant/Oval gem madness: Basicly, during normal gameplay, if you check one of the two campsites, the other kid will be triggered. He will give you his oval gem and you will be able to find a pendant in the desert. If he is not triggered, the pendant in the desert will be the oval gem instead. But there are inconsistencies because you can do stuff out of order. If you pick up the oval gem from the desert, the other kid won't spawn and likewise if you pick up the pendant from the desert before the other kid spawns, he will spawn inevitably. If you leave Bub behind, it will always be the pendant, even before triggering the other kid. If you take Bub with you, it will be the oval gem. If you look at a campsite, it will change into the pendant. If you pick it up as the oval gem, the campsites will disappear. Throughout your run, you want to pay attention to the life, fatigue, hunger and water addresses. If your life reaches 0, it's gameover. Pick up nearby berries and other food to keep those values high. You can also make use of the sleeping/resting options when in a shelter. You can sleep/rest/rest enough or even rest twice (which is faster than sleeping once). On some days, there is rain which makes you stop for 10 seconds to tell that you need an umbrella leaf. So you should avoid those days or bring an umbrella leaf with you. When cutting grass and then re-entering the area, there is an "every other frame" chance that the grass will have grown again. By making sure to re-enter on a good frame, you can keep grasses cut. This is a good timesaver in speedruns. Skipping cutscenes: Stepping on certain tiles will trigger cutscenes. You can skip those triggers by stepping onto the tile, pausing, quick-saving, resetting and continuing. Going out of bounds: You can go out of bounds in some places by stepping onto a tile that would trigger the room transition and performing the steps mentioned above. Use the luascript (at the bottom of this page) to make use of a camhack to see where you're going. At the beginning of the game, there is a trigger where the player will talk a bit and then enter the hut and talk some more. The dialogue in the hut is based on the text pointer that has been set at the trigger. You can use the Trigger Skip to bypass the trigger and perform a certain action to display different text (i.e. 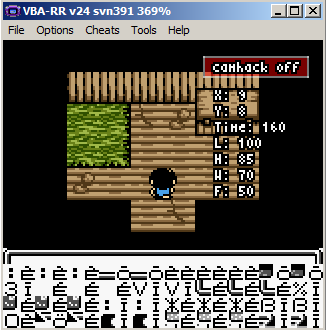 set the text pointer to something else) and then manually enter the hut to make the game run different text. In some cases, it will glitch out completely or crash. The listed effects below are based on what action you performed before entering the hut. TODO:Test other versions and systems.